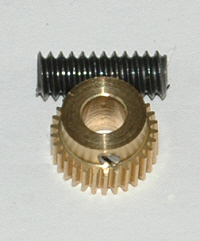 The 0.141"[3.58 mm] diameter worm version of this gear set is NOT available with either the 1.0 mm or 3/32" bore. Steel worms are ONLY available with 1.5mm, 2.0mm & 3/32" bores and 0.195" [4.95mm] long x 0.189" [4.80mm] Dia. Worm Bore * - Select -1.0 mm1.5 mm1.8 mm2.0 mm3/32"